The biographies of Sts. Michael and Arsenius the Georgians have unfortunately not been preserved. It is believed that at some point Arsenius moved from Khandzta Monastery to Palestine and labored there with a certain Macarius of Leteti. Afterward, St. Arsenius founded a Georgian monastery on Mt. Olympus in Asia Minor. Twenty years later, Venerable Ilarion the Georgian arrived on Mt. 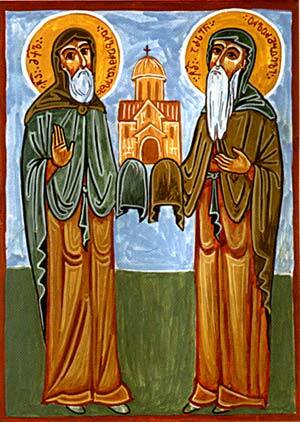 Olympus and found three Georgian monks who were almost certainly disciples of Michael and Arsenius.